We don’t watch much live television in our house, so it wasn’t until last night (during the presidential debate or some time after) that I saw my first No on 37 television ad. I only half listened, but was mortified by the twisting of information and the purposeful absence of the whole picture. I hate campaigns. Even the Yes on 37 campaign can be annoying at times. But, seeing that ad reminded me just how powerful large corporations are and how far they will go to prop up our broken food system (and their bottom line). I got my very first yard sign on Monday, and finally got it in the ground a few days ago. It was this act, poking the steel rods into the soil, that reminded me what is growing, what will continue to grow, whether or not Proposition 37 passes. There is an exciting and diverse food movement growing in this country and I feel surrounded by its possibilities here in my tiny corner of Altadena, California. So, instead of stewing about Monsanto, salmonella in peanut butter, and arsenic in rice, I took a moment to reflect on all the cool sustainable food stuff going on in my neighborhood. Every Monday afternoon I pick up a half share of produce from the Muir Ranch CSA. I drive a little over a mile to the high school to pick up produce grown on the campus and other local farms. The garden is student run and provides paid internships for students during the summer months. 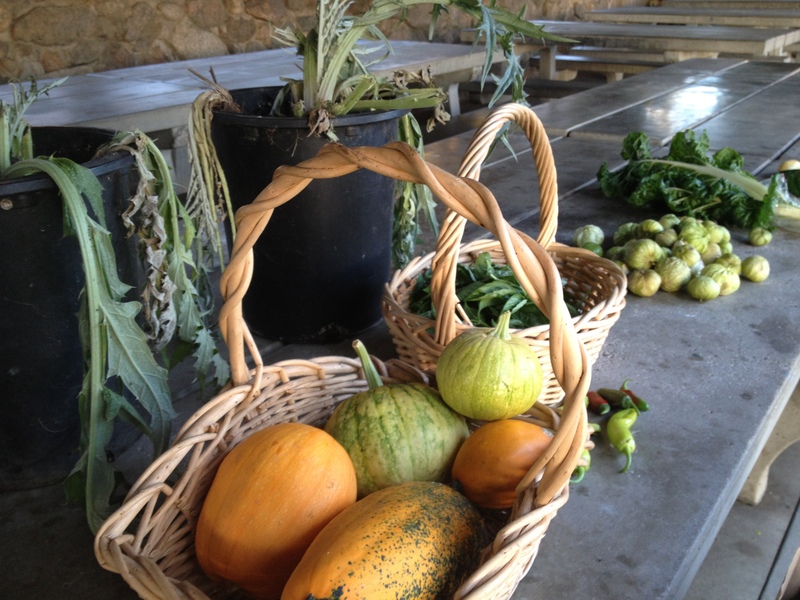 The CSA is growing rapidly and I love going to the Ranch every week. Then, there is the amazing RIPE Altadena. 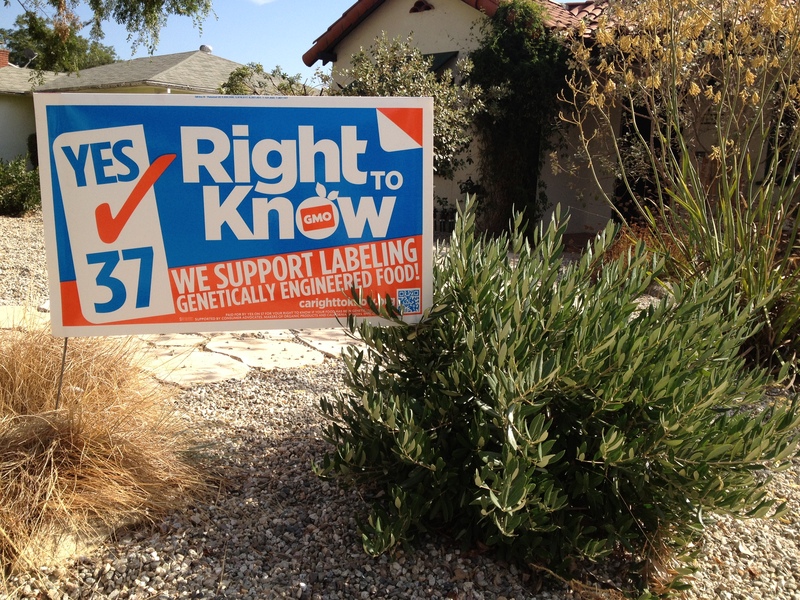 It was through RIPE that a member organized a bulk purchase of the Yes on 37 signs. With the signs came an impromptu crops swap. Over the course of the summer we have met half a dozen times in this very spot to share our abundance, knowledge, and friendship. I took home one of those artichoke plants (just in time because I think a couple of mine are not coming back). And then there are eggs. Many residents of Altadena raise their own chickens. 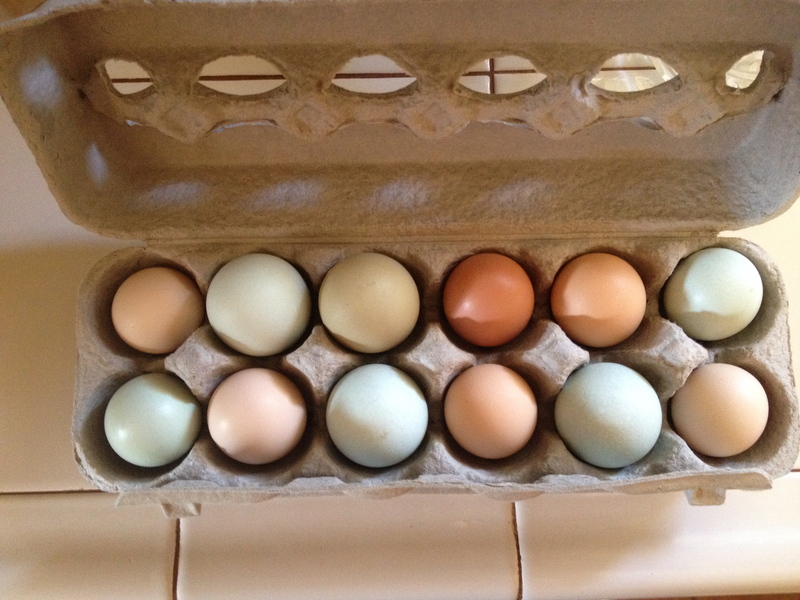 I frequently get my eggs from different neighbors or Sugar House Farm. There are few things that I enjoy more than a fresh as fresh can be poached egg. Just look at those beauties! Of course there is the Altadena Farmer’s Market. I have my issues with the market, but there is no doubt it is a positive force in the sustainable food movement. There is also a group of folks working hard to open a food co-op in our area. I have my own garden, as do many, many others. There are a lot of great people working toward creating a sustainable food system right here within a mile radius of my home. They are not going away, I am not going away. So, even if Monsanto wins this labeling battle, there will be more in the future. This I know. A couple of days after seeing the television ad, I flipped open the computer to catch up on some news and saw that the Los Angeles Times endorsed the No on 37 campaign. What? This can’t be possible, I thought. I then skimmed the eighty or so comments and saw only two that were in agreement with the paper, and knew that all was right with the labeling movement again. Proposition 37 will pass no matter how much money is thrown in “No’s” direction. Let it be a small victory as we work to create something different, a better way to bring food to our tables. Interesting to hear about the local food effort across the continent! We are doing much the same–home gardens, CSA’s, school gardens and farmers markets–here in NY State (just an hour north of the city). That is great to hear! I think the movement toward more sustainable food is only going to get bigger and bigger. I have found that one of the best ways of finding out what is happening around the country and other countries is from other people’s blogs.